A ski or snowboard holiday in Canada is a dream to many UK snowsports enthusiasts, but might be more within reach than first imagined. There are many factors to consider when planning a winter vacation, and the options can be mind-boggling. Dates & duration of trip are some of the first things to think about, particularly if you're tied to school holidays or peak periods. Then there's location- there's 5 continents of ski and snowboard resorts to consider spread across the Northern and Southern Hemispheres! It's easy to avoid a lot of the decision making by returning to the same resort each year, but where's the fun in that? We spoke with snow travel expert and UK-based tour operator John Spooner to help international travellers understand some of the options. TF: Why should UK snowsports enthusiasts consider Canada over Europe? JS: We UK skiers are we stuck in the Euro zone in more ways than one. Right now the euro is strong against the pound and along with many other factors, this affects the winter sports enthusiast both when booking and once in resort where they continue to suffer inflated prices for average services, long queues and crowded pistes. Although the independent traveller can take advantage of low-cost air carriers to Euro destinations, predominantly most guests tend to book with reputable operators such as Inghams & Crystal. These operators will take you to your usual places but even these now use low-cost carriers who pack you in to seats and transports and often you also must pay ski carriage direct to the airline further hiking the price. TF: Western Canada is about an 8-hour flight from the UK. How does this affect the price of a ski or snowboard vacation? 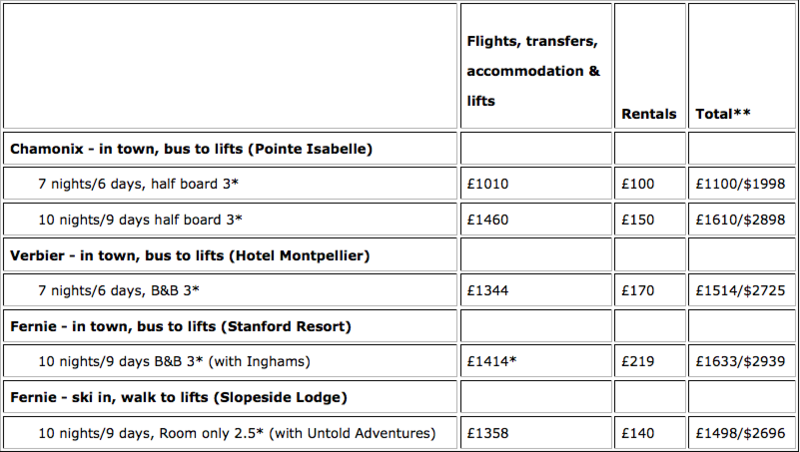 As you can see the hotels and ski packages are comparable and at times cheaper than your average European ski trip! In return for a longer travel day, the added value to your holiday experience is huge. *Prices for France taken from Numeo.com. Prices from Fernie are local and based on an exchange rate of £1 = CAD$1.80. 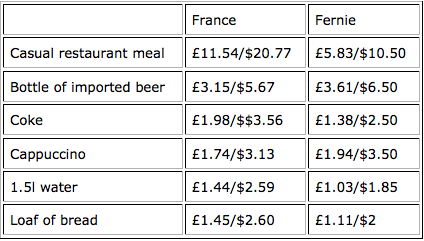 As many UK skiers will know, the prices shown here for France are a starting price, and prices at higher end/on-mountain restaurants may double or triple. In comparison, Fernie prices are low across the board and don't fluctuate a lot between in-town and on mountain- the price you see is the price you get and it's easy to budget and enjoy an evening out without breaking the bank. TF: UK skiers & snowboarders are familiar with European Resorts and know what to expect. Will Fernie live up to those expectations? JS: Fernie, British Columbia was voted one of the top 25 places to ski in the world by National Geographic, voted the best Resort in North America at the 2013 World Snow Awards in London, and is home of some of the best powder you will find anywhere. Ever! Canadian resorts offer pillowy soft snow, tree-lined pistes, gullies, groomers and acres of pristine off-piste slopes. Fernie has all this spread out across the mountain from one convenient start and stop point, on 142 uncrowded pistes with terrain to suit every level and no queueing for lifts! What more could you want? Add to this the fact that a beer will cost you the same as it costs at home, there's world-class food prepared with dedication at a variety of restaurants and the friendly locals and international workers not only speak your language but make it their mission to provide you the holiday of a lifetime. My family and I love it so much that we set up business here in the UK, Untold Adventures, to bring you what a ski holiday should be!